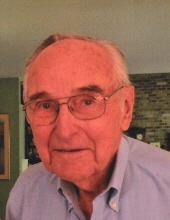 Andrew Preston Varley, 83, of Earlham, IA entered his heavenly home surrounded by family on November 19, 2018 while in Hospice at the Stuart Community Care Center, Stuart, IA. He was born December 2, 1934 in Des Moines to James Preston and Esther Ellen (Schutz) Varley - the best crop they raised that year. Andrew attended country school and graduated from Menlo High School in 1952. He graduated from (then) Iowa State College with a degree in Agricultural Economics in 1957. While there, he met Marilyn Saucke; they married August 23, 1959 at St. Peter Evangelical Lutheran in Farnhamville, Iowa. Andrew received his master’s degree in Economics from North Carolina State-Raleigh in 1961. In 1962 Andrew and Marilyn returned to Pine View Angus Farm in Adair County,where their 4 sons, Warren, Tom, John, and Curtis, grew up. Andy was first a farmer, a steward of the soil, raising cross-bred Angus cattle, and a planter of trees. Andy served on the Iowa Arboretum board and was a member of the American Conifer Society, along with Marilyn. Andy was a State Representative for 12 years, including Speaker of the House in 1973-74. Governor Robert Ray appointed Andy Chairman of the Commerce Commission (now Iowa Utilities Board), where he served for 8 years. From 1988 to 2000 he was Senior VP of Energy Pricing and Regulatory Service at American Electric Power in Columbus, OH. Among his many recognitions was the Outstanding Young Alumnus Award in 1968 from Iowa State University. Throughout his life, family, faith, and values reflected his belief in Jesus Christ as his Savior. He was a good, kind, patient man, serving others, who earned the respect of everyone who knew him. He was very proud of his children and grandchildren and loved them all deeply. We shall miss him and his wisdom. He is survived by his wife, Marilyn; sons Warren (Karen), Tom (Gina), John (Laurie), Curtis (Catharine); eleven grandchildren: Ben of Ramstein AFB, Germany, Gwen of Chatham, England, Yelena and Millie Varley of Stuart, IA, Dani (Kyle) Orris of Ames, Bethany (Mike) Treffert of Brooklyn, WI, Morgan Varley (Ryan Mable) of Cedar Rapids, Colin and Nathan Varley of Adrian, MN, Catarina and Annabella Varley of San Antonio, TX; sisters Marge Lucero of Oakdale, CA, and Belle (Neil) McPhee of Fenton, MI; brother Carl (Evelyn) Varley of Clive; brother-in-law Jose Madrid of Las Vegas. He was preceded in death by his parents and his sister Mary Madrid. Memorials may be directed to the Shining City Foundation, the Iowa Arboretum, or a charity of your choice. Visitation will be held Friday, November 30 at the Johnson Family Funeral Home in Stuart from 5-7 p.m. Committal Service will be at Jefferson Center Cemetery, rural Menlo, on Saturday, December 1 at 9 a.m. Celebration of Life Tribute will follow at Gloria Dei Lutheran Church in Urbandale at 11 a.m. (Professional Arrangements: Johnson Family Funeral Home & Crematory). To send flowers or a remembrance gift to the family of Andrew Preston Varley, please visit our Tribute Store. Burial will be held in Jefferson Center Cemetery in rural Adair County. A luncheon and a time of fellowship will be held following Andrew's Celebration of Life at the church. "Email Address" would like to share the life celebration of Andrew Preston Varley. Click on the "link" to go to share a favorite memory or leave a condolence message for the family.